On their website they have information about the events that they hold and how to get in touch with them. Leprosy Mission– CAN YOU HELP!!!! We collect used postage stamps!!! It is hard to believe that a bunch of used stamps can help transform the life of someone affected by leprosy. But the fact is that it can! Over the past 30 years, TLM Stamps & Collectables has raised more than £1 million to benefit people affected by leprosy. It takes seconds to rescue a used stamp from an envelope destined for the recycling bin but, by doing so, healthcare and opportunities can be provided to people in desperate need. If you have any used postage stamps that you want to give towards the Leprosy Mission then please bring them into school. Year 6 Remembrance Service at Abbey Hey Cenotaph- On Friday 9th November, Year 6 paid their respects at Abbey Hey Cenotaph, to all of those who sacrificed their lives and continue to do so, so we can live as we do today. The children made poppy wreaths, said prayers and were very respectful. Thank you Year 6, Miss Naylor, Mrs St Hill, Mr Nield and Miss O’Connor for representing our school at the cenotaph. Thanks also to the other children in school who have also bought a poppy this year. I will let you know how much you have raised for the Royal British Legion when they send us their thank you postcard in a few weeks. Whole School Ethos Day- On Friday 16th November, we held our third whole school ethos day around the theme of ‘Three in one’ and the work this year was based around out school logo and aimed to deepen our children’s understanding of Church, School, Community and the Holy Trinity of Father, Son and Holy Spirit. 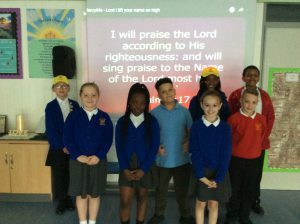 After the day was launched by our ethos team leading worship and everyone enjoying the Power in Me song, each class had stories to read from the Bible and exciting things to make- stand up crosses, colours of faith key rings and prayer boxes to name but a few things. We hope you also enjoyed joining your child/ren to see what they had learnt and made. Thanks to Ms Nichol, Miss Naylor and the worship team for their hard work in arranging the day. Thank You Vicar Worship- Week beginning Monday 22nd October was national Thank Your Vicar Week. We are fortunate at St Clements to have 2 vicars who come into school regularly to hold worship, hear children read and always on hand to support us. We therefore always take part in Thank You Vicar Week to show our appreciation to Reverend Paul, Reverend Tom and their families due to their commitment to our school and community. Each class presented them with lovely gifts and we also sang and prayed at our special worship. Harvest Festival- On Wednesday 10th October, we held our Harvest Festival in school. Thanks to the generosity of our pupils, families and staff, so far we have collected 267 tins so far for the St Clements Church Night Shelter. The tins of vegetables, soups, beans, stew etc will be used to make meals during the winter months and your donations are gratefully received. Our children also made place mats for the Night Shelter tables. Special thanks to Miss Naylor for organising the event and raising our awareness of others. Reception Class Welcome Service- On Thursday 25th October, we held our welcome service for our reception pupils and their families at St Clements Church. The other classes presented their new friends with gifts, we sang songs and St Clements Church gave each child a personalised Bible. We know that your children will be very happy with us and we look forward to seeing them grow over their time with us- it does fly!